The focus of Blue Home, Nth Island, NZ lies on the symbiotic relationship between humanity and nature. The angular edges of the structure – delicately left as thin strips of negative space – are balanced against the absence of straight edges in the surrounding landscape. Both the built and natural landscape share a cool palette of green and shadows of rich ultramarine blue. The bright, illuminated window of the home hints at humanity’s presence inside the house, leaving the world outside in quiet harmony. McKenna is a frequent traveller to New Zealand and has held solo shows in Wellington and Auckland. 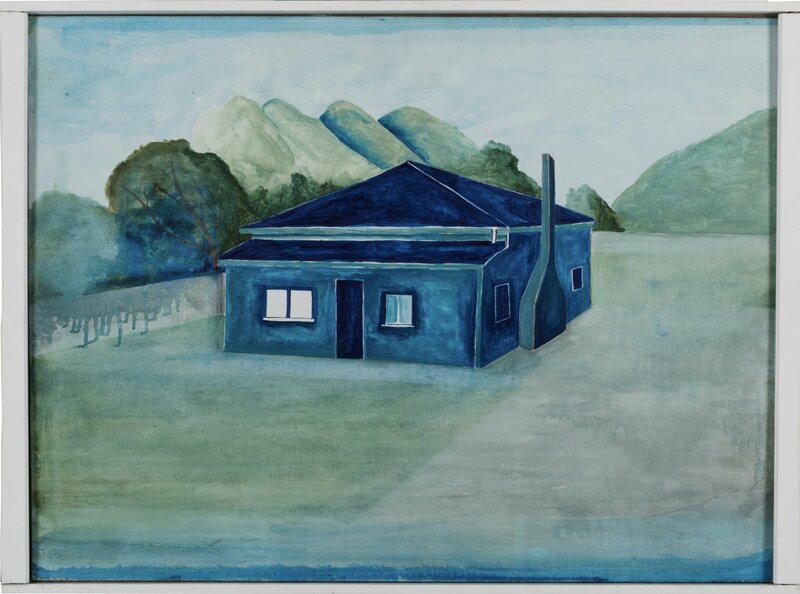 In 2012, he held a solo show Napier to Wellingtonat Bowen Galleries in which he documented his travels through the North Island. Now Sydney-based, Noel McKenna was born and raised in Brisbane in the 1960s and recalls a childhood spent in the suburbs in the era before front doors were locked, dogs were muzzled and concerns for OH&S prevented kids from climbing trees and play equipment. He initially undertook studies in architecture at the University of Queensland in 1974 and transferred to the art department of the Queensland College of Art a year later. In 1981 he moved to Sydney to study at the Alexander Mackie College. McKenna has worked for over three decades with a broad range of materials across painting, drawing, printmaking, ceramics and sculpture. McKenna developed an interest in ‘primitive’ art as a young man after reading the poetry of Sylvia Plath and following the artistic threads of her inspiration back to Paul Klee, Henri Rousseau and Giorgio de Chirico. There are echoes of surrealism within his works, with small moments – a window, an animal, an object – in his sparsely populated landscapes providing clues to an underlying narrative. Looking through the windows of homes, his works can carry the same effect as an Edward Hopper painting, a mode of storytelling through the unity of natural, structural and human elements. The primitive influence extends into his practice, with an intentionally childlike and innocent style and the painterly application of the enamel with exposed sections of canvas beneath the brushstrokes. In 2016 his work featured in 'Close to Home: Dobell Australian Drawing Biennial 2016' at the Art Gallery of New South Wales, Sydney. In 2014, he was the subject of a major solo exhibition 'ABSURDIA: Noel McKenna – A Focus' at the Newcastle Art Gallery, Newcastle. He is a five-time recipient of the Wynne Prize for Watercolour, Art Gallery of New South Wales, Sydney, and received the 1994 Sulman Prize, Art Gallery of New South Wales, Sydney. McKenna is widely represented in public and private collections in Australia and New Zealand.